In the game between Watford and Reading in the English Championship a week ago, the referee gave the goal even though the ball had not crossed the goal line between the posts and under the crossbar. It had crossed the goal-line, but outside the post! How could that be a goal? In a goalmouth scramble after a corner kick, the ball bounced off a defender and went over the goal line, wide of the right post, in mid air. But the ball was immediately hooked back into play by a forward (see arrow). It went to another attacker who shot the ball towards the goal where it hit the crossbar and bounced back into play. The AR flagged. The goalkeeper placed the ball for a goal kick, and everyone retreated out of the penalty-area. At this point the referee held up play and after a discussion with the AR, awarded a goal. The players at first did not understand the decision. Suddenly they realized what the decision was and of course then there was a major issue. Why did the referee do this? Because the AR had flagged that the ball had crossed the goal line, and from his position on the touchline, thought that the ball was between the posts, and so informed the referee. Although the decision was clearly wrong, the referee’s stubbornness took precedence over the players’ protestations and the goal stood. The final result was 2-2. Although this was an unfortunate incident, there is always something that can be learned to prevent this kind of thing from happening, something in this case that many referees and instructors fail to consider. That is the technique of gaining information from the players. Although usually players will claim the ball in most situations, such as throw-ins, corners etc., the time when they really appeal is for a goal scored. In this case there was no such appeal by the attacking players, because they knew the ball had not entered the goal, and were in fact continuing to try to score. These actions alone should have told the officiating crew that no goal had been scored. Furthermore, consider the action of the attacker who tried to keep the ball in play; had the ball been in the goalmouth, why would he have tried to prevent his own team from scoring? 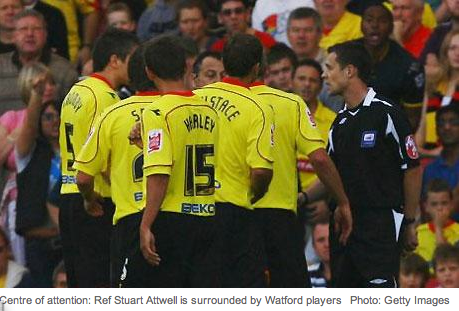 This was one of those occasions when the non-verbal actions of players can help a referee. The officials stubbornly stuck with their decision, even though there were substantial protests from the defending players. There was time to change the decision to the correct one (corner kick) at this point because the game had not been re-started. I am reminded of the advice I took from a very experienced referee and instructor. He said that in making a decision, you the referee, should not be the only one who is not surprised by it. In the best of all possible worlds, players of both sides, coaches, and spectators should also not be surprised. How true! As bad as the above is, I'm disconcerted with what happened after. Apparently, the Watford coach is facing discipline from the FA for "referee abuse" - in spite of said referee's decision being indefensible. Isn't it ironic that the FA would choose to stand behind this young referee who totally stepped in it - and yet throw under the bus the referee who had the nerve to send off John Terry? As Ed notes above "they knew the ball had not entered the goal, and were in fact continuing to try to score." Ed, you are very smart. When I was starting out as a referee I had this subconscienous thing that I was a "Judge" and all "decisions" had to come from me. This wasn't something I verbalized. Somehow, someway that concept got into my head. Only after several years experience doing, listening and watching other referees, I started to relax and let the "players" have a say in the decisions. I will tell you that it was quite a shock to my system. But the game became much more fun and I could devote my attention to more important things, like how the players were interacting with each other and WITH ME.. Just as in this game, the players "made the decision for the referee", not the referee. High level referees have this harmony. Long after I'd been considered a 'seasoned official', I was centering a U-12 match. Scrum in the GA, hand reaches out and slaps the ball down. Whistle, and indication for PK. As I'm setting up the restart, a Red player says, "Sir, wasn't that a Yellow player that hit the ball?" OOPs! Pause. Rethink. The kid was right. I replied, "Yes, you are correct, and thank you." Then I informed all the players that I was wrong, and signaled for a DFK for defense. I told him what had transpired. He said, "So, you're going to let the players call the game for you?" I replied, "When they are right, yes."